First cabin version of Boeing 747-400 operated by Lufthansa may transport 393 passengers in three classes. It is the most common version. Business class seats are located both in the lower deck and in the upper deck. There are totally 53 flat bed seats in the Business class. 31 seats of the Business class are located in the lower deck. 17 of these seats are located in the first section that contains 4 rows of the seats most of which have 2-2 configuration. Proximity of the galleys and lavatories may cause difficulties to passengers of the seats 4C and 4H. The other 14 seats are located in the second section in two rows that have 2-3-2 configuration. Other passengers of the Business class tend to gather in the area of the seats of the 10th row in order to visit lavatories located here. Behind the business class of the lower deck are located 36 seats of the economy class. The seats of the 20th rowmay have less space for passengers’ legs because of the bulkhead position. Premium Economy Class includes 32 seats located in 4 rows that have 2-4-2 configuration. All these seats are standard only the seats of the 24th row have restricted legroom due to the bulkhead position. Close location of the galleys may cause inconvenience to passengers of these seats. 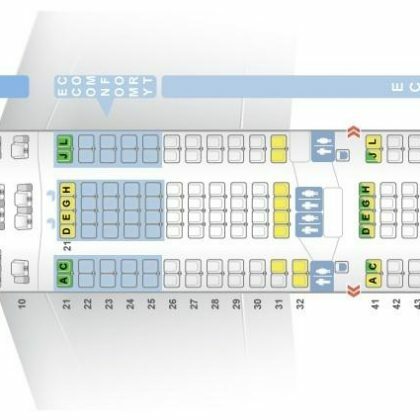 Behind the Premium Economy Class are located the other 272 seats of the Economy class. These seats are divided into three sections. First section has 3 rows of seats. The seats of the 29th row may have restricted legroom because of the bulkhead position. Close location to the lavatories may be bothersome for passengers of the seats 30DEFG and of the seats of 31st row. The second section of the Economy class is located behind the exit row. That is why the seats of the 32nd row have extra legroom. At the same time proximity of the lavatories may cause discomfort to passengers of these seats. The seats 33A and 33K are considered the best seats as they have extra space for passengers’ legs due to the missing seats in front. The only disadvantage of the seats 33C, 33DEFG and 33H is proximity of the lavatories. The third section of the economy class sis located behind another exit row and galleys. The seats of the 43rd row have limited legroom due to the bulkhead position. Proximity of the galleys may represent a problem. Close location to the lavatories may cause inconvenience to passengers of the seats 56BC, 56HJ, 57D, 57G and of the seats of the last 58th row. The seats 56BC and 56HJ as well as the seats of the last 58th row are considered bad seats as these seats may have limited recline. In the upper deck are located other 22 seats of the Business class. The seats 81C and 81H are standard but their close location to the lavatories may cause inconvenience. Proximity of the stair and galleys may be bothersome for passengers of the seat 86H. The second cabin version of Boeing 747-400 consists of 371 seats located in three classes. Business class seats are located in the lower deck and in the upper deck. In the lower deck there are 45 flat bed seats that have 180 degree recline. The seats of the first 4 rows have 2-2 configuration. Only the 4th row has one additional seat. Close location to the lavatories and galleys may cause discomfort to passengers of the seats 4C and 4H. The other 28 seats have 2-3-2 configuration. 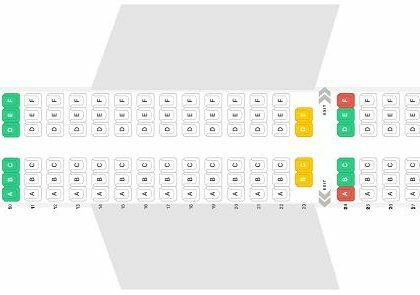 All these seats are standard only the seats of the 10th row have some peculiarities such as: limited space for passengers’ legs because of the bulkhead position and proximity of the galley and lavatories. Premium Economy class has 32 standard seats located in 4 rows. These seats have 2-4-2 configuration. The main disadvantages of the seats of 24th row is restricted legroom and close location of the galleys and lavatory. Economy class may accommodate 272 passengers. The seats are divided into three section. The first section is the smallest one. It consists of 3 rows of seats. The seats of the 29th row may have less legroom due to the bulkhead position. The main disadvantage of the seats 30DEFG and of the seats of 31st row is proximity of the lavatories. The second section of economy class eats is located behind exit row that is why passengers of the seats 32BC and 32HJ will take advantage of extra space for their legs. At the same time other passengers tend to gather in this area in order to visit lavatories. The seats 33A and 33K are considered the best seats as they have extra legroom as there are no seats in front. The only disadvantage of the seats 33C, 33DEFG and 33H is proximity of the lavatories. The third section of economy class is located behind another exit row. The seats of the 43rd row have limited legroom because of the bulkhead position. Close location of the galleys may also cause inconvenience. The seats 56BC and 56HJ may have limited recline. Their close location to the lavatories may be bothersome as well as for passengers of the seats 57D and 57G. The seats of the 58th row are the seats of the last row, these seats may be less reclining. Other passengers tend to congregate here to visit lavatories. These seats are considered bad seats. In the upper deck 22 seats of the business class are located. Proximity of the lavatories may cause discomfort to passengers of the seats 81C and 81H. Close location of the seat 86H to the galleys and stairs may be bothersome.